Seating is limited to 35 people, first come first serve. Cost: Registration is required, but there is no charge for the session. Materials and light meal will be provided. 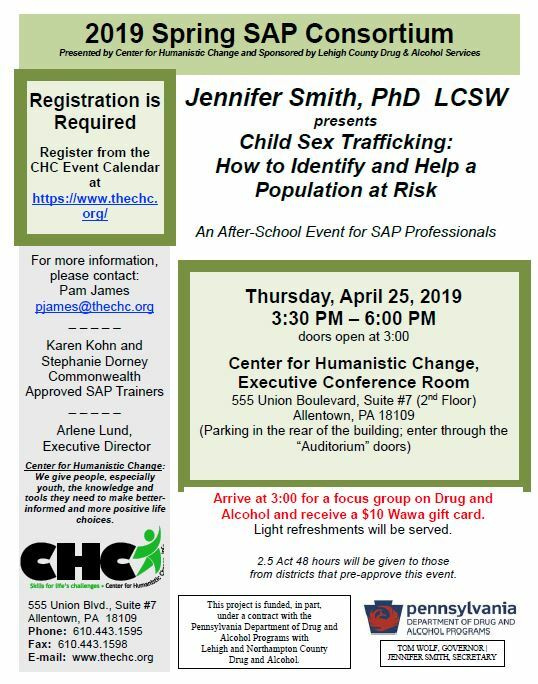 Center for Humanistic Change is excited to host the 2019 SAP Consortium.. Dr. Jennifer Smith works in private practice with children, families, and adults to promote growth and healing at Brownback, Mason, and Associates. Having completed her Masters of Social Work at Syracuse University and her Ph.D. in Social Work at New York University, Jennifer is a Licensed Clinical Social Worker (LCSW) who is committed to staying informed of best practices along with new and innovative treatment options. As a university lecturer, Jennifer has taught multiple courses on clinical practice and social advocacy. The information you enter during the registration process will be used to contact you, should there be any changes to this event.